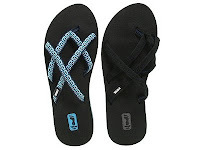 My friend Nicole wears these Teva sandals every day; she has a pair in every color. She has problems with her feet and swears by these. How convenient it must be for her to pick up a “two pack” from Zappos.com! Are Tevas as comfortable as Merrells?